On the Organization details screen, you can view or modify details about your organization, including name, timezone, and email address. Only full account administrators can update organization details. 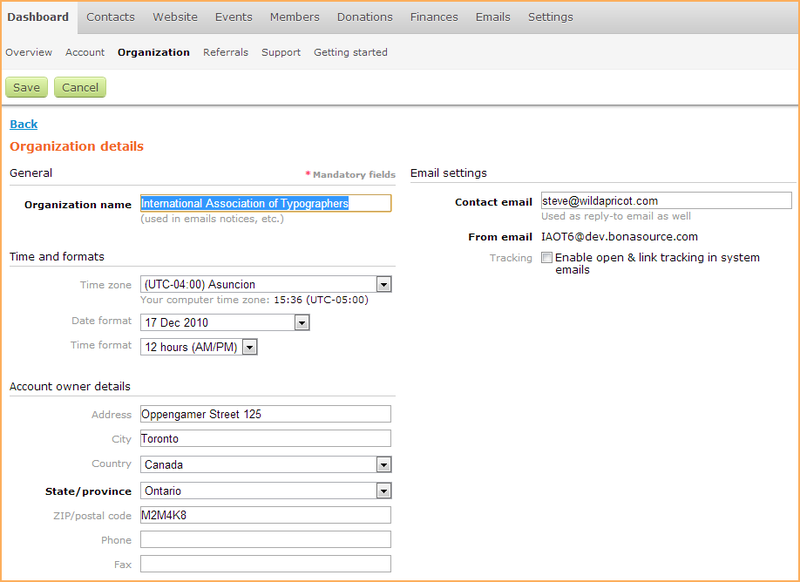 To view or modify your organization details, hover over the Dashboard menu then click the Organization option. You can modify the following organization details. Used in all locations where your organization name is referenced (e.g. email macros), including browser page tabs. The default email address to which all admin emails are sent. For information on routing system notifications to other email accounts, see Routing of system e-mails. Do not use the wildapricot.org address that appears in the From email field (below) since this address is not functional. The contact email address is also used as the actual reply-to address for all automatic emails, even if a different From email address is displayed (see below). Exception: if you specify an event organizer other than the organization contact, then that event organizer's email will be used as the reply-to address for the event's emails. The email address identified as the sender of emails from your Wild Apricot account. When a recipient replies to the email, the contact email address (see above) will be used as the actual reply-to address. If you are on a free plan or don't have a custom domain set up (e.g. your_association.com), then the From email will be set to your_domain_ name@wildapricot.org, where your_domain_name is your Wild Apricot domain name as it appears on the Domain name management screen. For example, if your Wild Apricot site is stevelivetestsite.wildapricot.org then the From email will be set to stevelivetestsite@wildapricot.org. Email addresses that end with wildapricot.org are not functional but are used to shield your contact email address from email harvesters. Emails sent directly to this address will be forward to your contact email address with the original message attached as an .EML file. You can open this file using Outlook or any text editor. To open it using Internet Explorer, change the file extension to .MHT. If you are on a paid plan and have a custom domain set up, you can set the From address to something@your_custom_domain (e.g. john@your_association.com). Be sure to add your custom domain without www as part of the custom domain setup process. If you set up a custom domain name without a valid TXT record, the From email address will still be generated from your free domain (i.e. wildapricot.org), and you will not be able to create a custom From address based on your custom domain. The default setting (enable or disabled) for email tracking. Email tracking allows you to track who opens your emails and which links they click on. Regardless of the setting here, you can enable or disable tracking for individual emails. Allows you to enable or disable the opt-in mechanism so that contacts can expressly provide their consent to receive emails from your organization. This is a key component in complying with anti-spam legislation, particularly the Canadian Anti-Spam Law (CASL). With the opt-in mechanism enabled, you can send consent request emails to your contacts, then track their opt-in status from each contact’s Email settings and log tab. Daylight Savings Times is handled automatically based on your location. Used to schedule the sending of emails and the timing of events. Automatic system emails like event notifications and renewal reminders are sent at a specific time of day relative to your time zone. Event registrations are automatically opened and closed according to the time specified in the event. Unless you customize the timezone for individual events, the time zone specified here will be used. If you change your time zone after an event has been created, you have to re-save your events again for the new time zone to take effect. 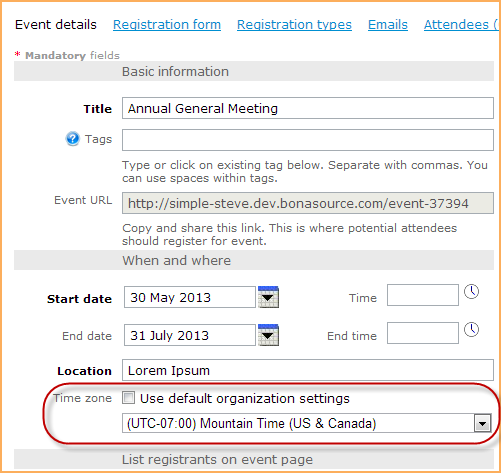 To customize the time zone for an individual event, go to the event details screen and click the Edit button. In the Time zone section, uncheck the Use default organization settings option and select a different time zone for the event. Format of dates displayed on your Wild Apricot site. The time format used on your Wild Apricot site. You can choose a 12 hour format (with AM and PM) or a 24 hour format. The address and contact information of the account owner. This information may be used to confirm account ownership.